A swag indentation in the center of this 14K antique style stackable wedding band allows it to be worn seamlessly with a diamond engagement ring. 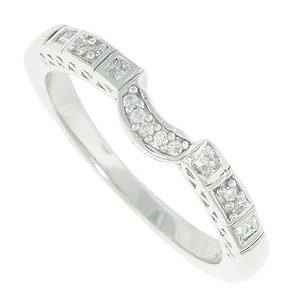 The central swag is set with diamonds while additional stones adorn the wedding band on either side. The band measures 3.68 mm in width. Photographed here with the matching engagement ring ERS3D314RG (sold separately). The band is frequently purchased as a set for $1200, but is also available individually for $600. Size 6 3/4. We can re-size. 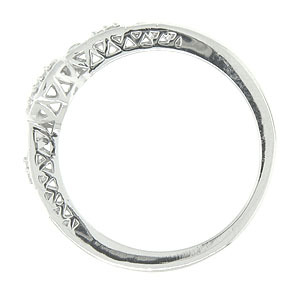 This ring can be special ordered in any size and is available in 18K, yellow gold and platinum.